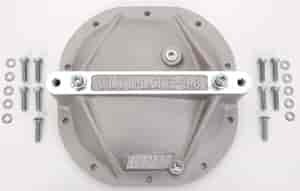 Proform Reinforced Differential Cover with Cap Support for Ford 8.8"
Proform 69501 - Reinforced Differential Cover with Cap Support for Ford 8.8"
Moser Engineering 7106 - Differential Cover Ford 8.8"
Bolt on six-tons of support strength! Strengthen your vehicle's rear end with the strongest rated support covers you can buy! These lightweight aluminum covers strengthen the rear housing from case distortion under load, preventing increased side bearing clearance and ring gear deflection. Two adjustable grade-8 bolts support and prevent both bearing main caps from movement and possible breakage. Offers increased fluid capacity, built-in fill and drain plugs, and hardware. JEGS Easy Kits are designed by JEGS professionals to ensure that you get all the correct parts you need. Kits include Support Cover, Gear Lube, differential cover gasket and RTV silicone gasket maker. Kits are designated by the letter "K" at the end of the part number. Does LPW 301-8.8 fit your vehicle? This will clear 4.56 gears.